Two days ago I posted a picture of one of the plants in my yard. It is not unusual of me to plant something and not know its name (and I sleep fine at night!) However, Midwestern Plant Girl was stumped and I hate to think my photo could cause her to lose sleep. The previous shot did not clearly show the bloom. 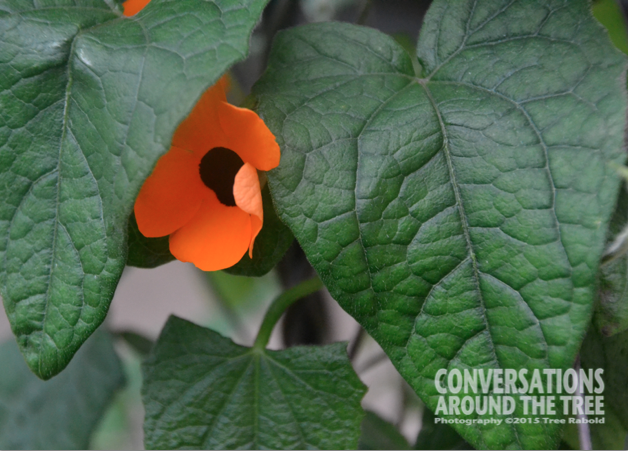 So here is a better photo of the bloom….hopefully this photo will help Plant Girl identify this flower. If not…I hope its not too devastating! This entry was posted in Uncategorized and tagged 365 photos, flowers, Nature, plants on May 27, 2015 by treerabold. I like the simplicity of the shape and the bright color. Lovely. Thanks for sharing. It is a beautiful little flower isn’t it? 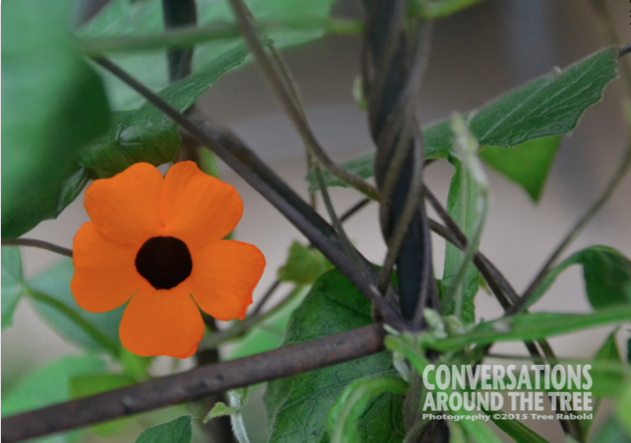 It is the Black-Eyed Susan vine, Thunbergia alata. I just googled your answer Aletta and that is exactly what my little plant is….thank you!! Beautiful bright color you captured, Tree! It sure is a neat orange color! Me too! It takes a village sometimes!! I really love the color of this little flower. Me too … especially against the dark green leaves.